The Kawasaki Z125 will go head to head in a sales race with Honda's Grom. A 125cc road bike isn’t one most riders would find interesting, let alone consider buying. They’re mostly considered “entry level” and pretty much only good for commuting – if you live close to work and don’t have to use a major road. But Honda announced recently it would bring the exciting little 125cc Grom into Australia, and that has caught the attention of even very experienced riders. Now Kawasaki has returned fire with its Z125 PRO, and seems set to battle it out in a new sales race. The Z125 and Z125 PRO were first unveiled at the 2015 Tokyo Motor Show and has been selling well in Asia since its release. 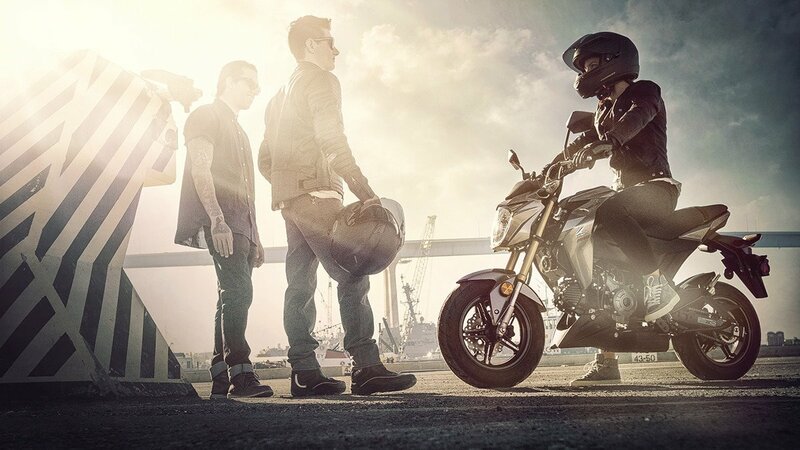 Like the Honda, the Z125 is a small bike that weighs a tiny 101kg. That’s about the weight of a 250cc motocross bike. Kawasaki refers to the bikes as the “nimblest super naked models to date”. Power comes from a 125cc SOHC fuel-injected, air-cooled four-stroke engine, and power output from the engine is expected to be about the same as the Honda at around 7kW. Both have a four speed transmission. The Z125 has an automatic centrifugal clutch, and the Z125 PRO is a full manual. Like the Honda, the Z125 has 12-inch wheels but the tyres are slimmer than those fitted to the Honda. The suspension is 30mm upside-down forks and mono shock rear, and disc brakes are mounted front and rear. Styling is taken directly from the bigger Z models and the exhaust is mounted under the bike similar to its larger siblings. Kawasaki Australia is yet to announce a price but has said the Z125 PRO is expected to arrive in Australia around the middle of the year. Both the Honda Grom and Kawasaki Z125 have been a hit in the markets they’ve already been introduced to. They’re light, they’re heaps of fun and they’re very well priced too.